Tomatoes are the most popular vegetable for home gardeners, which require plenty of sun and watering. 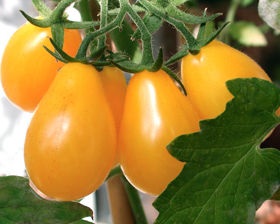 Golden Drops Tomato is a high decorative plant up to 160cm high fully with fancy bright yellow 25-40 gram tomato. It brights up your garden and brings a lot of tasty fruits from July to November. To produce a crop of ripe tomatoes earlier, seeds need to be sown indoors in March - April. They can be planted out in May when the risk of frost has past.